At Temple Moor, we want students to take responsibility for themselves, their learning and their future so that they are successful in all areas of their life. We need to prepare our learners for life beyond education, but also to instil confidence that they can overcome barriers they may face in the classroom and exams. We consulted with local employers across a range of job sectors to identify what qualities they looked for in employees, with a view to embedding these in our students. Over the last year, these five Qualities have become a fundamental part of Temple Moor. With all students now familiar with the language, they are beginning to demonstrate these throughout the school day. Provision at KS3 and KS4 follow carefully planned programmes to allow students the opportunity to set targets and reflect upon how they have demonstrated these qualities throughout the week both in and out of school. To build upon their prior knowledge of these Learning Qualities, KS3 students are completing refresher activities in form time. At KS4 the Learning Qualities programme has been developed further to model its application through study skills. This year, each form have been assigned Quality Leaders (sixth form students) to support in the delivery of form time and share experiences. The Quality Leaders will lead on the delivery of one Quality per half term, engaging students through a range of tasks. Throughout the year, rewards assemblies are held to recognise the achievement of students who have demonstrated the Learning Qualities consistently, using employers to present awards to further re-inforce the link between these qualities and the world of work. Our KS5 students have been at Temple Moor for five years already; had success, made mistakes and learnt the lessons. Which is why we are now providing a platform for our Sixth Form students to share these experiences with their younger peers to inspire and raise aspirations. This year we have assigned each of our Sixth Form students to a lower school form. Every Wednesday they will join the form and work as a team alongside the form tutor to raise the profile of the Learning Qualities. In this leadership role, they themselves will develop and demonstrate the skills required to apply for University, apprenticeships and better prepare them for life beyond Temple Moor. Becoming a Quality Leader allows students to be a role model and have a positive impact with younger students. Year 13 have all completed work experience so have experienced first-hand the importance of the Learning Qualities within a work setting, which they are able to reflect upon and share. Quality Leaders will become an integral part of form time and are an excellent example of the Temple Moor community working together. This year we have introduced Quality Time in all lessons at Temple Moor. Quality Time is a minimum of ten minutes in each period of the school day, across all subjects, whereby the teacher takes a step back and allows students to take ownership and independence of their own learning. Quality Time enables students to demonstrate qualities; initiative, resilience, critical thinking, challenge and reflection in their learning. This focused time provides learners with opportunity to develop key skills required in both education and the wider world of employment. This is particularly relevant to KS4 and KS5 students who are preparing themselves for higher education and apprenticeships. During Quality Time, students will complete a range of challenging tasks, both written and practical. Examples may include, but are not limited to extended writing, planning, reading, analysis or assessment. These carefully planned activities, which are completed in silence, encourage students ‘think ahead’ so that they are prepared and able to access the work without being reliant upon the teacher. 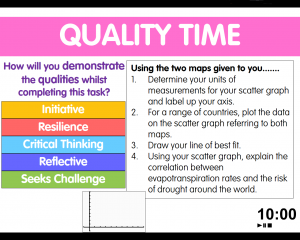 A visible timer enables students to manage their time effectively to complete the task.